For anyone who doesn’t know how to read sheet music, all those symbols can look like gibberish. You don’t necessarily have to be able to read music to be a successful musician (many skilled guitarists, for example, manage to get by using only guitar tabs), but it can certainly expand your options. Fortunately, learning to read music isn’t as difficult as many people think. The staff, or stave (pictured below), is made up of 5 lines, with 4 spaces in between. Each of these lines and the spaces represent a different note. As you move up the staff (from the bottom lines to the top ones), the notes are incrementally higher-sounding; when you move down the staff, the notes are lower-sounding. The horizontal lines in the image above separate or distinguish the different notes in the staff. When looking at sheet music, you will also see evenly spaced vertical lines. These vertical black lines (called “bar lines”) divide the staff into measures. The notes filling these lines and spaces depend on a symbol at the far left-hand side of every staff, known as the clef. In most contemporary music, there are really only two types of clefs you should be familiar with: the bass clef, and the treble clef. The notes in a staff that starts with a treble clef have a higher pitch (i.e. are higher sounding) than notes contained in a bass clef, which have a lower pitch. In the image below, you can see that from the bottom line in the staff to the top one, the sequence of notes is E-G-B-D-F, while the notes represented by the spaces in between the lines are (from lowest to highest, or left to right) F-A-C-E (remember—taken together, they spell out “face”). An easy way to remember the line notes is to make up a sentence with words that begin with each of the letters (notes) in sequential order. 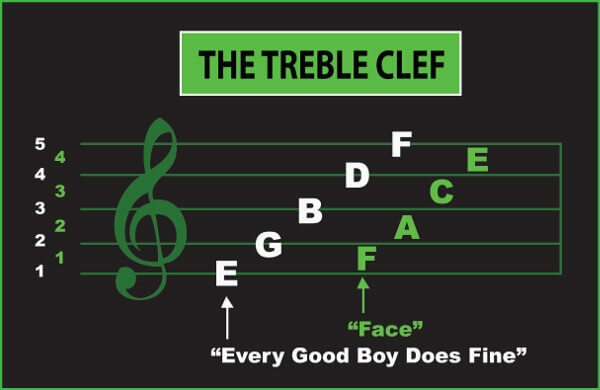 Following this rule, many musicians remember E-G-B-D-F by recalling the sentence “Every Good Boy Does Fine”. 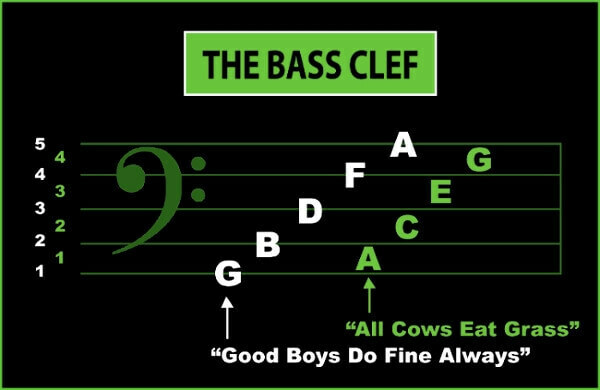 When you see the lower-pitched base-clef on the left side of the staff, this time the sequences of notes (from the bottom line to the top) is G-B-D-F-A (“Good Boys Do Fine Always”), while the sequence of notes represented by the spaces is A-C-E-G (“All Cows Eat Grass”). In the diagrams above, we learned that the lines and spaces on a staff tell us which notes to play. The type symbols placed on a staff (also called “notes”) tell us how long to hold or play the note for. In the most basic sense, being familiar with the meanings of these symbols and understanding the significance of their position on the staff is really all you need to know to be able to “read” music—probably not as complicated as you expected! Each note symbol has three parts: the note head, the stem, and the flag. The note head is the circular part of the symbol, and you’ll notice it’s either filled in (black) or open (white). Pay close attention to the position of the note head, noticing whether it is located on a line or in one of the spaces. Looking again at the diagrams above, depending on where the clef is located on the left side of the staff, the position of the note head tells you which note to play. The stem is the long “stick” attached to the note head. You’ll notice that sometimes the stem points upwards, and other times it points downwards— this actually has no effect on the note played, or the length of time it is played for; it simply makes the staff look less cluttered, and the music easier to read. The presence or absence of a note stem is significant when talking about note values, which we will get into below. The flag is the little “tail” at end of the stem, always located on the right side. Like the note head, the flag also tell us the duration, or length of time a note is held for. 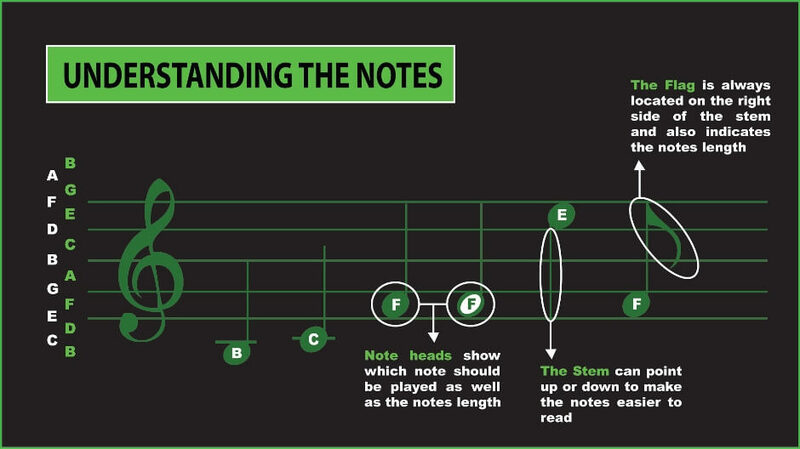 The presence of a flag shortens the duration of a note; notes with two flags are shortened even further. These three components of note symbols are what distinguish different note values, pictured below. Looking at the image above, a whole note is denoted by an “open” note head, without either a stem or a flag. A half note also has an open note head, but has a stem attached to it. A quarter note, on the other hand, has a filled in head and flag. The math is pretty simple: Four quarter notes = two half notes = one whole note. So what does this “whole note—half note” business really tell us? In practical terms, a whole note is held for 4 beats, while a half note is held for 2, and a quarter note is held for 1 beat. This brings us to the time signature component of our music. The beat is the music’s “pulse”—when we clap our hands or tap our feet to a song, we do this in time with the beat. In order to figure out the beat when reading sheet music, we need to understand time signature, represented by two numbers stacked on top of each other, which are located next to the clef on the left side of the staff. The top number of a time signature tell us the number of beats in a measure (i.e. in each section of the staff separated by the vertical bar lines), while the bottom number tells us the note value for a single beat. Looking at the diagram above, if the sheet music is written in 4/4 time, each measure has 4 beats, and the quarter note gets the beat. If the music is written in 2/2 time, each measure has only two beats, and the half note gets the beat. 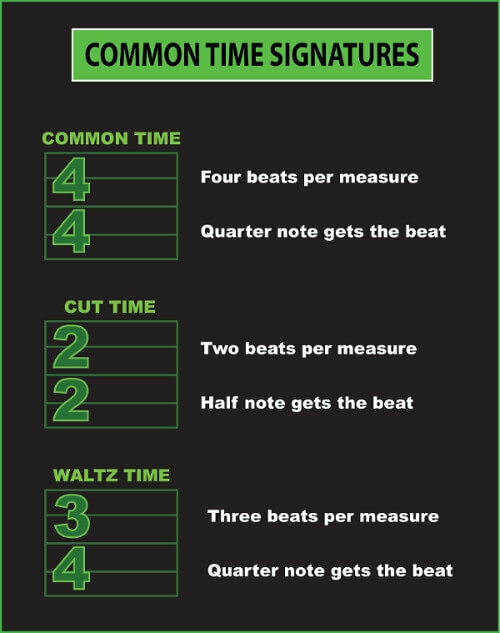 If the music is written in 3/4 time, there are three beats per measure, and once again, the quarter note gets the beat. There you have it, the basic knowledge you need to read music. That wasn’t so hard, was it? Understanding what the symbols and their positions on a staff mean and actually being able to play the notes on an instrument are two different things. Maybe you’re already familiar with major and minor scales, for example, but are wondering what they look like when translated into sheet music. Don’t worry—we’ve got you covered!